Fast forward 20-plus years. I did not become a K-9 cop, but I do work for a company whose mission is to help all dogs, including those in uniform, achieve optimal genetic health through our DNA testing process. 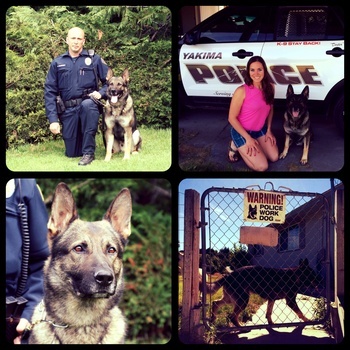 Paw Print Genetics is currently working on a research study involving police dogs in the U.S. Through our work with many police departments throughout Washington state, I have been blessed to meet many different K-9 handlers and their four-legged partners. The characteristic that is homogeneous among all of the handlers is this: the officers love their dogs. Officer Mark McKinney and K-9 “Dexter” from the Yakima Police Department in central Washington were kind enough to allow me to ride along with them on a regular night shift in June. Though a situation requiring Dexter’s assistance did not arise while I was there, I learned an incredible amount about the daily routine of a K-9 team. Most police K-9’s live with their handlers. This means that they also live with family members and other household pets. Police dogs are highly trained weapons in the appropriate situation, but are usually well mannered in a home environment if trained appropriately. Dexter lives amicably with a female Labrador retriever and a cat. Many retiring K-9s will spend their golden years with that same handler and his/her family. Just as a normal family couldn’t imagine re-homing their loyal senior dog, neither can the police handlers who spend countless hours fighting crime with their K-9 partners. Patrol dogs like Dexter are primarily used for their powerful noses. By and large, these dogs are not aggressive toward humans unless they are directed to be so. The dogs are trained to find and track active human scent, which proves useful when searching buildings or large open areas for people or evidence. In rare cases, a patrol dog will be deployed to chase, catch and hold a non-compliant person. Other types of dogs used by the police include dogs that search for narcotics and dogs that search for explosives. K-9 teams must pass a state certification exam following 300 hours of initial training. Post-certification, the pairs must complete a minimum of 16 hours of training per month to hone and maintain skills such as obedience and scent detection. The health maintenance of a police dog is top of mind for the handler and department administrators. Police dogs are extremely expensive to purchase and train, therefore the departments want to ensure the longest careers possible for these valuable members of their team. Regular veterinary and dental visits are a part of every working K-9’s life. K-9 squad cars remain running at all times during a shift and are equipped with a special system that regulates the temperature inside the vehicle to ensure that the dog remains comfortable. Genetic disease testing for inherited disorders is becoming more common among working dogs as DNA testing has become readily available in the marketplace. A large majority of patrol dogs are German shepherds, for which Paw Print Genetics offers nine genetic tests. Several of the diseases for which tests are offered are tragically common in the breed (some with more than a 25-percent affected rate) and can cause career-ending health issues for these beautiful and brave animals. Through genetic testing, Paw Print Genetics hopes to partner with police departments in our region, nation and world to create healthier and stronger K-9 police teams in the future. As you celebrate the 4th of July this weekend, make sure you stop for a moment to thank one of the men, women and service dogs that work hard every day to keep us safe.